These booklets are designed to support osteopaths going through the fitness to practise process. 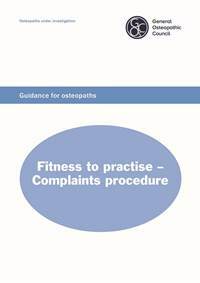 Fitness to practise - Complaints procedure explains the GOsC's fitness to practise procedures generally and sets out what an osteopath needs to do if a complaint is made about them. This booklet will be provided to osteopaths at the point they are notified of a complaint. 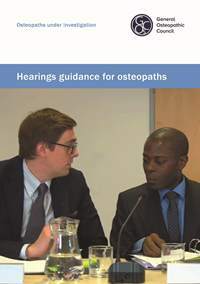 Hearings guidance for osteopaths contains detailed guidance about preparing for and attending a hearing. It will be provided to osteopaths if a case against them is referred for a hearing.